Boucher's residence was related to her master’s research in which she developed a critical analysis of the discursive and non discursive pratices of the biopolitical becoming through a specific analysis of individuation process (Simondon) of the artificial uterus. Marie-Pier Boucher is a Ph.D. student in the department of Art, Art History and Visual Studies at Duke University. She holds a B.Sc. and a M.Sc. in communication sciences from the Universite de Montreal. Her work draws upon complex systems theory, speculative pragmatism, bio- and neurosciences, and space art in addressing architectural and spatial practices. She has been collaborating as a theorist and co-editor on Adaptive Actions (Madrid Abierto, Spain, 2010 and Leonard & Bina Ellen Art Gallery, Montreal, Canada, 2010) and BioARTCAMP (Banff Centre for the Arts, Canada, 2011). She is a guest editor and member of the editorial committee of Inflexions, an open-access journal for research-creation. 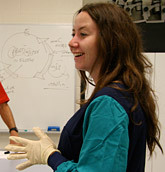 Her research residencies include: Max Planck Institute for the History of Science, Berlin, Germany (2010) and SymbioticA, Center for Excellence in Biological Arts, University of Western Australia, Perth (2006). She has presented her work in multiple venues across Canada, the United States, England, Germany, the Netherlands, France, Spain, Turkey and Australia. Her research is supported by the Visual Studies Initiative (Duke University) and the Social Sciences and Humanities Research Council (Canada). Boucher's residency was related to her Master's thesis, The Metaformatted Life: Prolegomena to the Exo-Sphere, in which she questioned the creation of new political identities by raising a number of ethical and political issues surrounding the construction of emerging biotechnical environments. More precisely, her research consisted in a critical analysis of the discursive and non discursive practices of the individuation process of the artificial uterus. At SymbioticA, she conducted both a technical and a social analysis of the bioreactors used by TC&A artists in the form of an artistic experimental generative form of the artificial uterus. Her analysis foregrounded the convergences and divergences proper to the individuation/concretization process of the artificial uterus in relation with both the natural uterus and the bioreactor. The passages and adequations between these forms lead to what she calls metaformation. By this play on words, she means that (1) life is being METAformatted by philosophical discourses and moral values, (2) metamorphosed by a set of processes and technological concepts that (3) enable its metaFORMATION i.e. its actualisation into both scientific and artistic realms. Metaformation is for her the name of a science-fiction, one that exposes the complexity of the relations between bios and tekne, between meta and formation, by revealing the generated metamorphosis, namely the real emergence of biotechnical entities/environments. Boucher conducted interviews with artists and scientists of the School, participated in SymbioticA's workshops and gave a talk a the Metaphors and Misunderstandings Symposium. This six month residency as a part of her Masters in Communication at the Universite de Montreal, partially funded through the Universite de Montreal and the Quebec Governement.